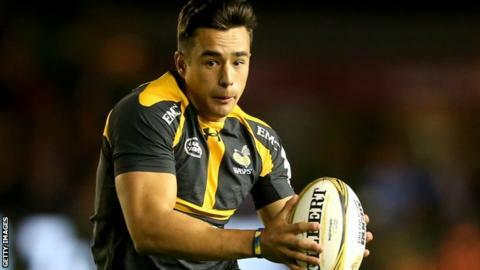 Saracens have agreed deals to sign Wasps fly-half Alex Lozowski and Fiji Sevens player Savenaca Rawaca. Both Lozowski, 22, and Rawaca, 24, have signed "multi-year" contracts with the Premiership champions and will move to Allianz Park this summer. Lozowski has made 24 appearances for Wasps since rejoining the club from Yorkshire Carnegie in 2014. Rawaca, who can play centre or wing, will link up with Sarries after playing for Fiji at the Rio Olympics. Saracens moved for Lozowski after former England international Charlie Hodgson decided to retire at the end of the season to become head of recruitment at the north London club. Wasps director of rugby Dai Young said he was "disappointed" Lozowski would be leaving the Ricoh Arena this summer. "We really wanted him to stay. He's a very talented player and we certainly had big plans for him here," the Welshman said. "We have been in discussion with Alex since the end of last season, trying to agree a contract extension. "However, Alex made us aware early on this season that he planned to move on."